The virtualization obfuscation technique is known to possess excellent security among software protection techniques. However, research has shown that virtualization obfuscation techniques can be analyzed by automated analysis tools because the deobfuscate virtualization obfuscation methodology is fixed. 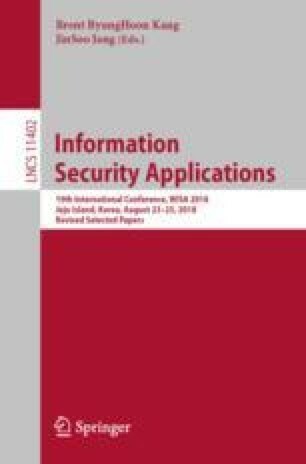 In this situation, additional protection techniques of the virtualization structure have been studied to supplement the protection strength of virtualization obfuscation. However, most of the proposed protection schemes require a special assumption or significantly increase the overhead of the program to be protected. In this paper, we propose a delayed analysis method for a lightweight virtualization structure that does not require a strong assumption. Hence, we propose a new virtual code protection scheme combining an anti-analysis technique and dynamic key, and explain its mechanism. This causes correspondence ambiguity between the virtual code and the handler code, thus causing analysis delay. In addition, we show the result of debugging or dynamic instrumentation experiment when the additional anti-analysis technique is applied. This work was supported as part of Military Crypto Research Center (UD170109ED) funded by Defense Acquisition Program Administration (DAPA) and Agency for Defense Development (ADD).